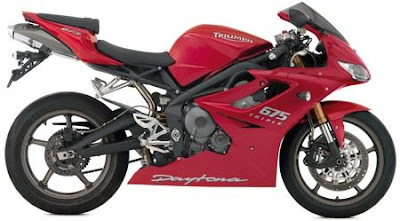 February 2, 2009 - Triumph’s award-winning Daytona 675 has been revised and updated for 2009 with a host of modifications that improve on the bike’s class-leading handling and performance. The bike that caused such a stir by becoming the first three-cylinder machine to enter the Supersport class now weighs in at just 356 pounds and develops 126 BHP. 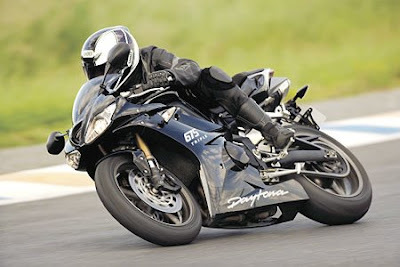 “Triumph has taken an evolutionary approach with the Daytona by applying experience from racing in the 2008 Supersport World Championship directly to the street version of the Daytona 675,” said Jim Callahan, North American Marketing Manager for Triumph Motorcycles. The 2009 model’s 675cc three cylinder engine utilizes a rev limit that is 450rpm higher than the 2008 model and features the hydraulic cam chain tensioner and higher ratio first gear. The racing-inspired parts were formerly available as race kit options through Triumph dealers. The bike also features a lighter exhaust system, a recalibrated fuel injection system and a revised cylinder head with new valves and a modified combustion chamber. These adjustments contribute to a seven-horsepower increase that brings power output to 126 bhp at 12,600rpm. The additional 450 rpm allows the engine to rev to a 13,950rpm redline. New, lighter wheels give significant savings in unsprung weight and further help the bike’s excellent handling characteristics. A new magnesium cam cover also contributes to the weight-saving as a further benefit to racers and track day enthusiasts. As could be expected from a bike with a racing pedigree, the Daytona 675 comes equipped with top-of-the-line suspension and brakes. The fully-adjustable 41mm upside down forks and rear monoshock unit both benefit from highly sophisticated high and low speed damping control, allowing riders to set their Daytona up with maximum accuracy. New radial-mount Nissin monobloc front brakes give even greater levels of stopping power and rider feedback. Even the latest Pirelli SuperCorsa SP tires have been specified for their outstanding levels of both grip and feedback. 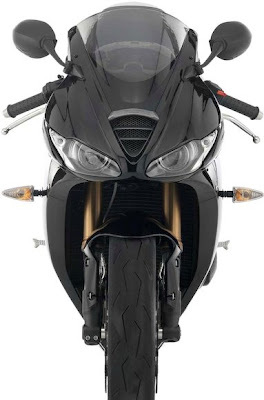 But it’s not just the performance that’s been enhanced – the 2009 Daytona 675 has also been restyled with a new cockpit, headlamp and screen. It comes in two color options, Jet Black and Tornado Red, and will come with a full range of official accessories. The Triumph race kit and a new ‘plug and play’ quick-shifter that are part of Triumph’s genuine accessories range will help assure the Daytona 675 will be competitive on the track at all levels, from club to world championship. Motornya keren2 banget.. jadi pengen punya motor keren juga nih..
@Tio Hasegawa: Saya berusaha menyuguhkan info tentang motor baru yang keren-keren untuk anda semua. Makasih telah berkunjung. WOW! this is a great bike but the gap between the tail and the tire is a little more. Blogku dah ganti template lho...mampir ya! I need this article to complete my assignment in the college, and it has same topic with your article. Thanks, great share! Looks great!! Daytona is amazing with all its features and the sporty look makes every ride joyous and fun. I like this post which is so informative and interesting about the scooter..